DESAUSSURE, Wilmot Gibbes (1822-1886) was a brigadier general in the South Carolina militia, who served along with the Confederate States Army in South Carolina at various times during the American Civil War. As a colonel, he led his regiment in the occupation of Fort Moultrie and the bombardment of Fort Sumter at the beginning of the war. He was appointed brigadier general as well as adjutant general and inspector general of South Carolina militia in 1862. He commanded part of the Charleston defenses during the Union siege of the city in 1863. He also led his men in opposition to Major General William T. Sherman's march through the Carolinas. 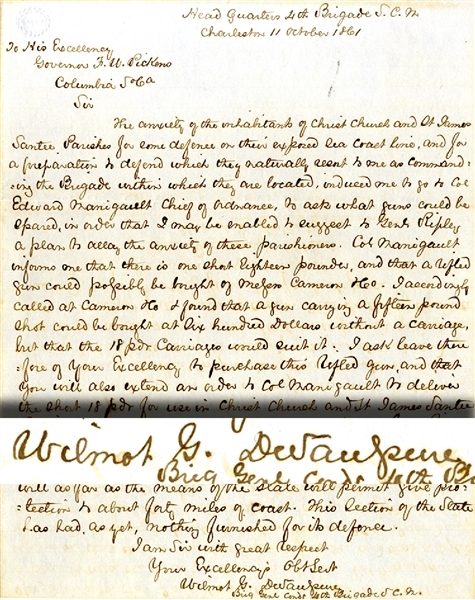 War-date Autograph Letter Signed “Wilmot G. DeSaussure Brig. Genl. Comdg. 4th Brigade S.C.M.” 1pp. quarto, Head Quarters, 4th Brigade S.C.M., Charleston, South Carolina, October 11, 1861, addressed to Governor Pickens of South Carolina, and reads in part: “...The anxiety of the inhabitants of Christ Chruch and St. James Santee Parishes for some defense of their exposed sea coast line...Col. Manigault informs me that there is one short eighteen pounder, and that a rifled gun could possibly be bought of Messors Cameron & Co. I accordingly called at Cameron & Co. & found that the gun carrying a fifteen pound shot could be bout at six hundred dollars without a carriage but that the 18 pound carriages would suit it....” and in the hand of Governor Pickens on verso reads “Genl. Gist will consult with me as to this.” Fine condition.